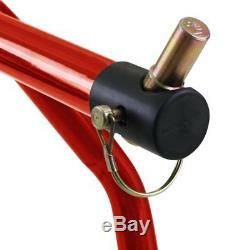 Constands motorcycle crutch front under steering column front head classic triumph street triple 07-16 red. Object number: 663812 / lk-classic-5pin-051. 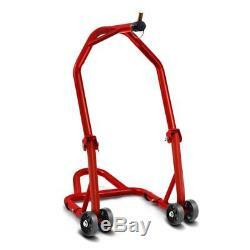 Constands front crutch under steering column. 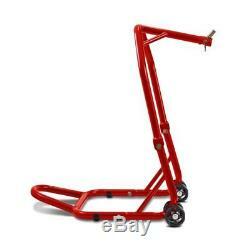 Simple and safe lifting of the front wheel for repair and maintenance. 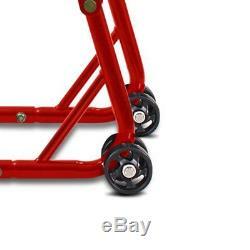 Allows the disassembly of the tubes of the fork and the wheel. Ideal for long-term storage and wintering. With adapters of different diameters for many models (13mm, 15mm, 16,5mm, 17mm, 18mm). Only can be used in combination with a rear mounting stand. Triumph street triple 2007 2008 2009 2010 2011 2012 2013 2014 2015 2016. Concerning the product offered, it is only an accessory or a spare part, and in no case an original product of the manufacturer of the vehicle. On the manufacturer's mark an indication shall be affixed clearly indicating the destination of the product offered as an accessory or spare part. This makes it possible to identify to which type of vehicle the product proposed is intended. 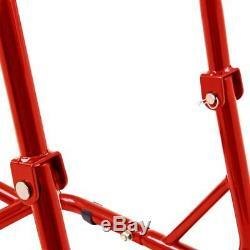 The item "motorcycle stand stand before classic triumph street triple 07-16 red" is on sale since Thursday, December 22, 2016. It belongs to the category "cars, motorcycle parts, accessories \ motorcycle \ accessories \ jacks, holders \ crutches workshop. " The seller is "motea-france" and is located at nrw. This item can be shipped to the following countries: America, Europe.